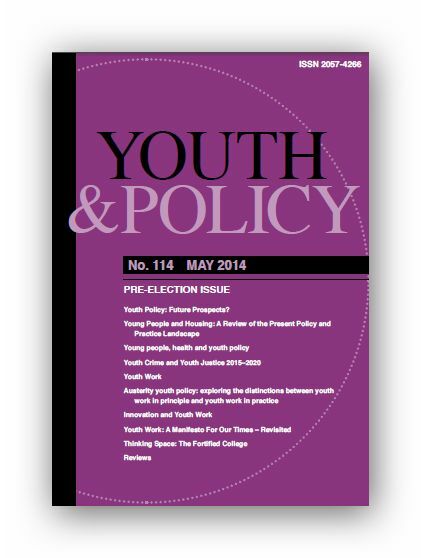 Youth & Policy 114 is a bumper special indeed! Published ahead of the coming election it is a challenging mix of sometimes controversial commentary on both youth policy and youth work. While the articles very much stand alone, all authors provide careful reflections on the social policy needs of young people, what they consider to be the key issues for young people today and what this means for the future direction of policy. It is hoped that not only will the articles provide stimulating food for thought as we approach a key transitional phase; the juncture between the Coalition Government and the likely change in governance to take place from 2015, but also that they will inform ongoing debate and political activity which works for the benefit of young people in our society. If young people’s housing needs are to be met more adequately, there needs to be a more fundamental reexamination of how the tenure system works for young people in the UK. In this article we review public attitudes to the health of young people. We note that too often concerns about the health of adolescents are linked with a notion of risky behaviour. This article considers current issues in crime and justice in the UK and how these may bear upon young people over the next five years. This article focuses on the place of youth work which is presented as a distinctive form of practice with young people complementing other approaches such as schooling or social work. It offers suggestions on how youth work can be re-built. Presenting ethnographic material from three years of research with casually paid youth workers, volunteers and young people, the article illustrates some of the contradictions embedded within the Coalition government’s youth policy. In this endeavour the discussion also demonstrates respondents’ commitment to the principles of child centred, open access youth work. Innovation has long been central to the survival of youth work as a form of welfare practice. During a period when local and central government spending is being curtailed how can we expect innovative practice to emerge without the stimulus of state funding and in the face of state indifference to youth work per se? Talking of the plans to build plans to build an £85m ‘secure college’ for 320 young offenders Brian ponders, “I have been to places much like the one focused on in this article; I’ve breathed the air and felt their harsh caress”. This is an especially stimulating Y &P offering and it deserves our serious attention. With this in mind we’ll be returning to a number of the articles in due course. The Youth Work Manifesto is available as a pdf in its own right.